OSHA issued a Notice of Proposed Rulemaking to better protect personally identifiable information or data that could be re-identified with a particular individual by removing provisions of the “Improve Tracking of Workplace Injuries and Illnesses” rule. 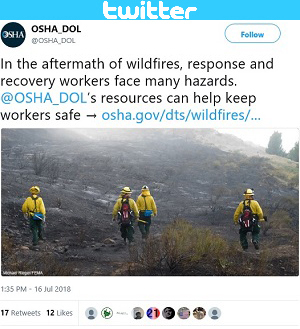 OSHA believes this proposal maintains safety and health protections for workers, protects privacy, and reduces the burdens of complying with the current rule. 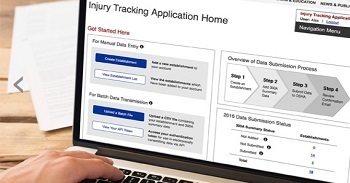 The proposed rule eliminates the requirement to electronically submit information from OSHA Form 300 (Log of Work-Related Injuries and Illnesses), and OSHA Form 301 (Injury and Illness Incident Report) for establishments with 250 or more employees that are currently required to maintain injury and illness records. These establishments would be required to electronically submit information only from OSHA Form 300A (Summary of Work-Related Injuries and Illnesses). For more information, read the news release. 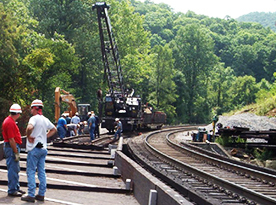 OSHA is seeking public comment on a proposed rule related to railroad construction equipment provisions in the Cranes and Derricks in Construction standard. The rule is intended to maintain safety and health protections for workers and address employers’ concerns with compliance. Read the news release for details. OSHA will publish in tomorrow’s Federal Register three Susan Harwood Training Grants funding opportunity announcements for Targeted Topic Training Grants, Training and Educational Materials Development Grants, and Capacity Building Grants. A total of $10.5 million is available for nonprofit organizations including community and faith-based organizations, employer associations, labor unions, joint labor/management associations, Indian tribes, and colleges and universities. The grants will fund training and education for workers and employers to help them identify and prevent workplace safety and health hazards. Harwood applications must be submitted online no later than Sept. 2. For more information, read the news release. 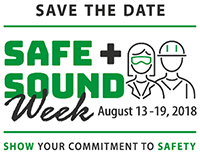 Safe + Sound Week is Aug. 13-19. Register to join the more than 1,000 organizations already planning to participate. The Safe + Sound website offers free training and events, including a workshop from Maryland OSHA and webinars from the National Safety Education Center and Chief Insurance Solutions, LLC. 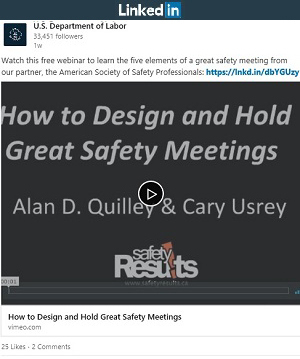 A free OSHA webinar can help you to change your approach to safety and health as well as plan an event. Visit the Safe + Sound Week webpage for more information. OSHA cited five contractors for safety and health violations after three employees were fatally injured and two others critically injured following an explosion on board a towboat. The five companies collectively received 55 violations with proposed penalties totaling $795,254. The employers were ship repair contractor First Marine, LLC, which has been placed in the agency's Severe Violator Enforcement Program; insulation contractor Thermal Control and Fabrication, Inc.; blasting and painting contractor Joe Rupcke; and temporary staffing companies Hutco, Inc., and Wise Staffing Group. OSHA issued citations for exposing employees to asphyxiation, fire, explosion, chemical, trip, and drowning hazards; allowing hot work/welding to be performed without testing for an explosive atmosphere; and failing to test confined spaces before entry, train workers on confined space entry operations, and label chemical containers. For more information, read the news release. A U.S. District Court Judge has ordered Design Plastering West, LLC, to pay criminal and civil penalties for criminal violations of occupational safety and health standards after an employee suffered a fatal fall at an apartment complex in Dallas. The court ordered the company to pay a $150,000 criminal fine, $100,000 civil penalty, admit to eight willful violations, and undergo OSHA monitoring for four years. After a worker fell from a third floor balcony in 2015, OSHA cited the company for willfully failing to install scaffolding and provide workers with personal fall protection. In May 2018, Design Plastering West, LLC, pleaded guilty to the willful citation on fall protection. Read the news release for more information. Stone countertop manufacturer U.S. Granite faces $318,687 in proposed penalties for exposing employees to machine hazards. Inspectors determined that the company failed to remove damaged lifting slings from service, train workers in lockout/tagout procedures, review the company’s lockout/tagout procedures, complete a hazard assessment, and provide employees with adequate hand protection. OSHA cited the company for similar violations in May 2015. For more information, read the news release. OSHA cited Timberline Hardwood Floors, LLC, for willful and serious safety and health violations. The company failed to: implement lockout/tagout procedures; train forklift operators; repair exposed electrical circuits; and develop hearing conservation and chemical hazard communication programs. OSHA proposed penalties totaling $182,917. Read the news release for more information. OSHA cited Karrenbrock Excavating, LLC, for allowing two employees to work in an unprotected trench while installing sewers. The company failed to use benching, sloping, shoring, or other protective systems to prevent a trench collapse; train workers to recognize and avoid unsafe trench conditions; and ensure that materials were kept at least two feet from the trench edge. The company was fined $189,221. Read the news release for more information. Maryland Occupational Safety and Health issued 26 citations and $82,800 in penalties to Stulz Air Technology Systems, Inc., for exposing workers to multiple safety hazards. The company failed to train workers on the control of hazardous energy, ensure workers wore required protective clothing when testing energized equipment, and install guards on punch presses and press brakes. Tennessee Occupational Safety and Health issued two citations and $51,200 in penalties to M&K Home Improvement for exposing workers to fall hazards. Inspectors concluded that the company failed to train workers on fall hazards and fall protection, and did not provide required guardrail systems, safety net systems, or personal fall arrest systems. Reynolds Polymer Technology, Inc., an acrylics manufacturer, contacted OSHA’s On-Site Consultation Program when first developing its safety and health program. During this collaborative effort, the company implemented a Safety Training Observation Program to find and fix hazards, provided OSHA 10- and 30-hour safety training for employees, and installed a state-of-the-art ventilation system to limit employee exposures to acrylic polymers. The company achieved a total recordable injury and illness rate nearly 70 percent below the industry average, and saved more than $20,000 on its workers’ compensation premiums. As a result, Reynolds Polymer was accepted into OSHA’s Safety and Health Achievement Recognition Program. For more information, read the success story. OSHA's Strategic Partnership Program provides opportunities for OSHA to work with stakeholders to eliminate serious hazards and enhance workplace safety and health practices in major corporations, government agencies, private sector industries, and at large construction projects. OSHA, the Associated General Contractors of Georgia, Inc., and Brasfield & Gorrie, LLC, entered into a partnership to promote safe work practices during construction of a sales center and warehouse in Union City, Ga. The three-year partnership will address falls, struck-by, caught-in/between, electrical, silica, and noise hazards, as well as heat illness prevention. OSHA and Alberici Healthcare, LLC, are partnering to promote safety during the construction of a hospital in St. Louis. The partnership will address falls, as well as struck-by, caught-in/between, and electrocution hazards, which are the top four causes of fatalities in construction. OSHA and McCarthy Building Companies, Inc., entered into a partnership to protect workers during the construction of a veterans ambulatory care center in Omaha, Neb. The partnership will address construction hazards such as falls, struck-by, caught-in, and electrocution; educate employees and employers on best practices; and encourage worker participation in safety and health programs. 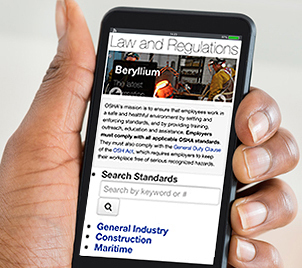 OSHA redesigned the Law and Regulations webpage that features information on standards and rulemaking. Users can now search standards by keyword or number, find a list of key resources, and see the latest updates on active rulemaking. The page also features information buttons to explain regulatory language that may be unfamiliar to some users. Visit the revised page to learn how OSHA accomplishes its mission through rulemaking.